Love these tables. This is a great way to have 2 tables when you need them. Great white top with angled edge to give small detail to look expensive but they weren't. Comes in one box and easy to put together! 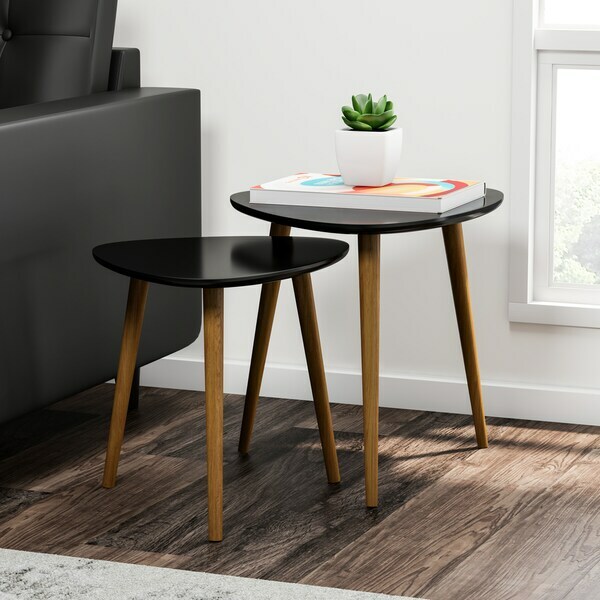 Complete the modern look of your home with the addition of these triangle-shaped nesting end tables. Featuring easy-to-clean piano-finish tops and four contrasting solid wood legs, these tables provide a sturdy spot for your decorative items. Dimensions 19.0 In. X 19.0 In. X 19.0 In. We use these as coffee tables for our living room. We love the style with the clean, white top and simple wood legs. The size and nesting work well for our small 1 bedroom apartment. They can be nested together for an end table, or spread out more widely for coffee table, TV dinners, etc. They only have three legs which I think looks good from a style perspective and for nesting, but they can be a bit unsteady if you give them opportunity to tilt (or have an infant wandering around). I don't think this is a problem with the table inherently, just something to consider with the design and what you intend to use the tables for. Overall, we're happy with quality and aesthetic as well as value. We'll be keeping these, but will exercise caution if we have potential for spills on the table or a baby nearby. These were packed very well and didn't sustain any damage during shipping. Super easy to put together - all you have to do is screw the legs onto the tabletop and stick adhesive floor protector pads on the bottom of each leg. The finish looks good. They're cute little tables, BUT they're super small. So make sure you get out a yardstick or measuring tape (which I did not do) to see just exactly how short these tables are: 20" &amp; 22". When I put a large table lamp on the taller one next to my sofa, the top of the lampshade only came up to the top of the back of the couch. So I had to move the tables to the other side, where I have a floor lamp. 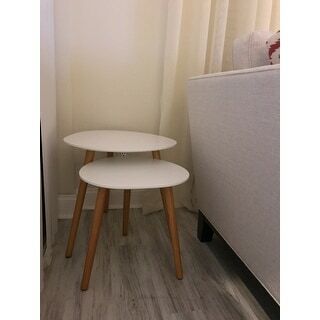 Love these Nesting tables. They are super cute and easy to put together. We are using them as end tables in my daughter room . She is pre-teen and loves that they can be separated and moved around easily as she is always rearranging her room. I LOVE these tables! I get so many compliments on them. They are very modern looking, quick and easy assembly and nest perfectly under one another. Also, the top is smooth and cleans easily. I purchased these about 6 months ago and they've remained sturdy. These are great. Nice wood finish. Very sturdy, but light. Very easy to assemble. Looks high end. Quality is ok. Legs are wood, solid and sturdy, but not finished well. The bottons on a few legs are finished, and a couple others are rough cut. Can't really tell once rables are upright and setting on a rug. The white tops are fine. All in all fun design, very functional, light weight which is what I was after, quite sturdy. Ok purchase but not top quality. Love these cute little end tables! It took me about 3 minutes to install. They add a minimalist feel to my living room. Very simple yet modern. I find the matte black finish of the table top and the wooden legs easy to match in any living room. I love these nesting tables! They were easy to assemble and look nice from a distance and up close. Even though the tops are not made of wood, they still look and feel like quality. I purchased the white finish on these tables. It fits well with my decor. The tables are well made and sturdy. Currently I have a fairly large potted plant on displayed on each table. The tables have no problem supporting the weight and are stable. I feel that the price point was fare for these tables. Pleased with my purchase. I love this set!! perfect, just the way I want it!! These just came today an I ordered another set for my upstairs bedroom. Supereasy to assemble, flat pack for ease of movement, and the surfaces are set for drinks, books, etc. I am beyond thrilled with this purchase. These little tables are awesome!! They look much higher end in person. They are the perfect size. So happy i purchased them! I love it! It looks awesome and very light. I highly recommend it for small and/or rather dark rooms. It was put together in less than a minute. I like this but wish they were both a little taller to side tables. they are far below the arm of the chair and its a pain to reach over and set things down. Super cute. A breeze to set-up, just screw the legs on and you're ready go. I have mine set up with plants on it, but they're big enough to put whatever on them. I like them but they are no actually "nesting" tables. The smaller table does not fit under the larger table and I chipped off a little of the surface edge when I tried. Easy to put together was the look I was going for. They seem very sturdy. I love these little tables! They fit perfectly into the little corners and nooks of my living room, and I liked them so much that I ordered a second set for my bedroom. Not the highest quality but looks great. Easy to assemble. Legs were a little lighter than pictured. "Can the legs be painted"
We do not recommend any alterations be made to our products. We cannot be held liable for any damages that may occur from alterations to our products. "What are the width and length dimensions? Are they triangular or round? Pictures don’t help much. Thx!" These tables are triangular. Large table is measured as 19"L x 19"W x 19"H and the small table is measured as 15.75"L x 15.75"W x 15.75"H.
"Can anyone answer the height of each table? I see it listed as 20-24", but I am looking for a more accurate measurement." The dimensions of the large table are approximately 19 inches in diameter x 19 inches high, and the small table measures as 15.75 inches diameter x 15.75 inches high. "I ordered White color set but the height of two tables are same not like the pictures, and the a part of paint for the smaller tablet top was off. Can you guys send a set of longer legs for the bigger table and send a new table top for the smaller one?" "When you will have the white ones?" "what color is the java finish?"